If you're the poor sucker in charge of designing a mid-peninsula high-speed rail station, here's what you must do: start with the ridership estimates for full 2035 system build-out, and apply Technical Memo 2.2.2 (station design policy) as handed down from above by Parsons Brinckerhoff, the firm in charge of the HSR system design. Table 6.1 has all the relevant formulas that you'll need to size the outer concourse, controlled waiting areas, how many restrooms, etc. All that remains is to plug and chug the formulas and presto, you've got yourself a station. The result of this formulaic approach to station design can be seen in the recent sizing study for a potential mid-peninsula station at Mountain View, which is very similar to the notions also being entertained for Palo Alto or Redwood City. Key statistics: about 8000 daily HSR boardings, 67000 square feet of floor area (not including platforms), and 3000 parking spaces. The station shall funnel every passenger through a sequence of functional spaces that broadly mimic an airport. The station shall be divided into a public concourse and an access-controlled area requiring possession of a valid ticket. 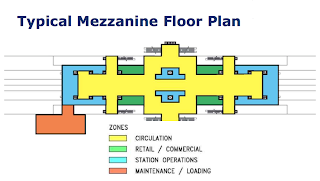 The station shall have a mezzanine, a large access concourse located above or below the platforms that provides the "necessary" floor area to funnel passengers from a grand station entrance (complete with "entry plaza") through "check-in", shops and restaurants, and possibly "security" to a "gate". 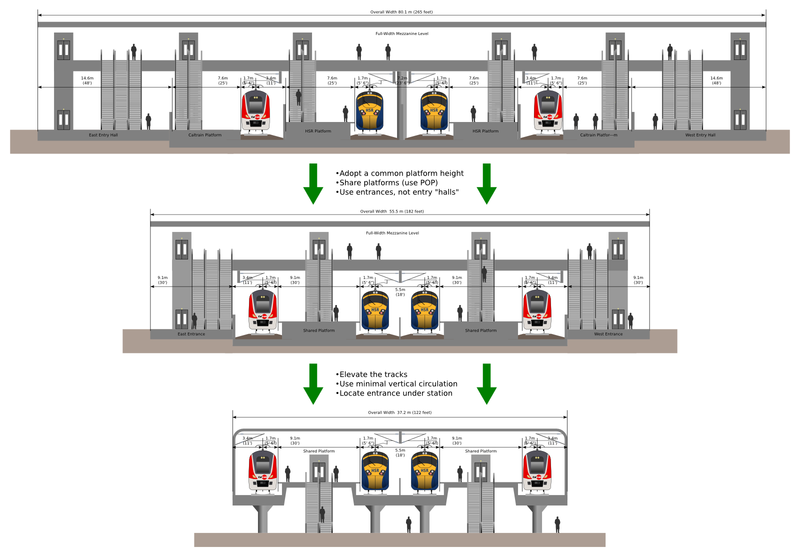 The HSR platforms shall be used exclusively by high speed trains, and may not under any circumstance be shared with Caltrain. The same track and platform edge may not be served by both HSR and Caltrain. The same platform at opposite platform edges may not be served by both HSR and Caltrain. The HSR platforms shall be fully access controlled with high fences, even if such fence is used to segregate the HSR platform from an adjacent Caltrain platform. 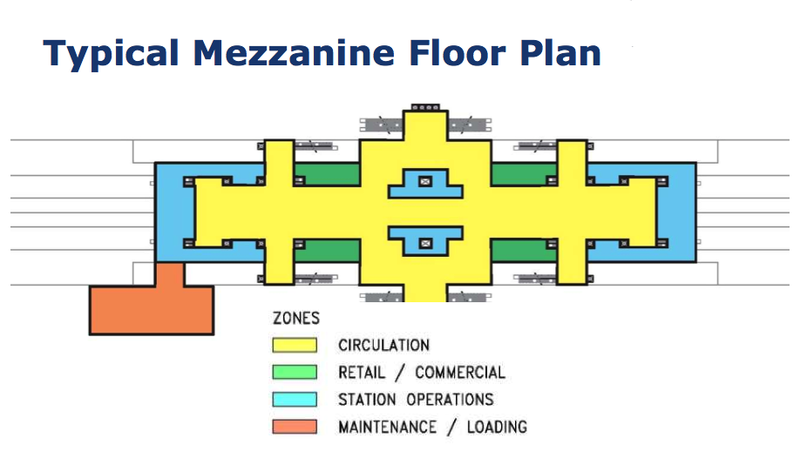 Passengers transferring between HSR and Caltrain shall use escalators and transit via the mezzanine. Maximum vertical circulation is encouraged, and convenient cross-platform or same-platform transfers are explicitly disallowed. The station shall have gargantuan amounts of automobile parking (1000 spaces at the station, and another 2000 spaces within 3 miles). None of these "requirements" make any sense, except to maximize the size and cost (and profit) of building such grandiose but operationally dismal infrastructure. What is being envisioned here is not an integrated rail network, but well and truly a flight-level zero airline. It doesn't have to be this way. In France or Germany, any bum off the street can drag a large suitcase onto a high-speed train five minutes before departure without ever passing through a security check or a fare gate. Tickets are checked on board, using what's known as proof-of-payment or POP: if you can't produce a valid ticket when asked, you are issued a citation. POP obviates all this sterile-area gated fare-paid-only nonsense, with enormous simplification of the process of getting from point A to point B. Is POP a gaping security hole? Not if you consider that bombs brought on board high-speed trains are a rather unreliable way to achieve mass carnage. That's why over several decades, such an attack has only been carried out once, and then rather unsuccessfully. The target environment will necessarily be far richer over on the Caltrain platform. 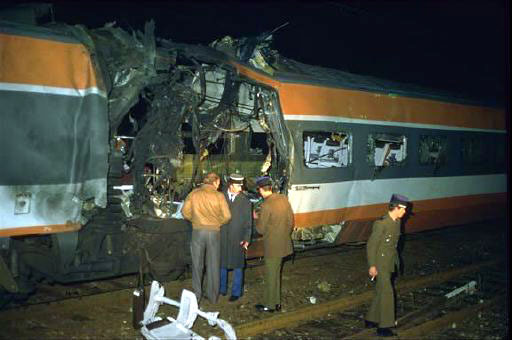 Terrorists in Madrid knew this when they attacked at Madrid's main HSR terminal; all their bombs went off on packed commuter trains. So, a rational evaluation of threats (one not based on security theater) leads to the conclusion that HSR need not look like a BART fortress on steroids. In Europe, land of POP, commuter rail and HSR routinely share platforms, leading to far more efficient use of space inside stations. For example: Paris, Berlin, Karlsruhe, Hamburg (on a sacrilegious curved platform, no less! ), Brussels, and dozens more. 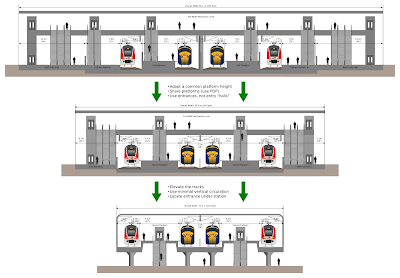 Appropriate station design requirements have an enormous effect on the resulting designs, with overall width dropping from an elephantine 265 feet (as depicted in the sizing study) to a more manageable 122 feet. At a time when the HSR project is increasingly under attack for being insensitive to peninsula communities, perhaps a reevaluation of station requirements would improve the chances of someday achieving a context-sensitive solution. Mountain View, for example, could have the highly-effective, low-impact intermodal station previously described in this space. Q #31: The RFP addresses HSR. What assumptions should the proposer make in order to address HSR requirements? A: Evaluation of the potential for the proposed solution to meet future HSR needs will not be part of the proposal evaluation. Q #43: [Caltrain] states that "the system will be required to be interoperable with the train control system selected for HSR operation throughout the California High Speed network." Since this train control system has not been identified, how can the contractor ensure that their system will be interoperable by the 2015 implementation date? A: The Caltrain PTC system must be interoperable with existing tenant railroads by Dec 2015. HSR is not an existing tenant railroad. There. Just in case there remained even the shadow of a doubt: Caltrain couldn't care less about interoperability with HSR, but is focused like a laser on interoperability with Union Pacific freight trains, a.k.a. "tenant railroad." Caltrain is betting all its chips on the AAR's Interoperable Train Control (ITC) project, an industry-wide consortium effort to stonewall and delay the federal PTC mandate. If there is any doubt about what the AAR (representing the big freight railroads) thinks about PTC, read their litany of complaints and ask yourself just how likely it is that ITC will be completed on time--regardless of the law. Expect the AAR to slow-walk PTC just as the Europeans run rings around us worldwide! ORIGINAL POST: Caltrain's planned Positive Train Control system (known as CBOSS) has been out to bid for a little while now, and the Request For Proposal process is continuing with some back-and-forth Q&A between Caltrain and prospective bidders in advance of the November 3rd deadline. It's October 2010, and Caltrain still considers high-speed rail as an afterthought. Shall we give them another raise? Also, just where is the funding for CBOSS going to come from, and is the undetermined funding source why Caltrain refuses to change the wording of the contract payment terms from "will endeavor to pay" to "shall pay" (see question #11) ?